Rage 2 Gameplay Trailer | Nerd Much? Following yesterday’s tease, we got our first look at Rage 2 gameplay today. And it looks just like the car heavy, intense post-apocalyptic first-person shooter we were expecting. But in one hell of a good way. The game looks incredibly frenetic. As you traverse the wasteland there just seems to enemies everywhere. And you have a plethora of weapon options to help dispatch of them. The game looks to play like a combination of Doom, Bullet Storm and Mad Max. Fast past gunplay, brutal melee attacks, and of course, the ability to drive anywhere across the vast wasteland. The inspirations make sense. 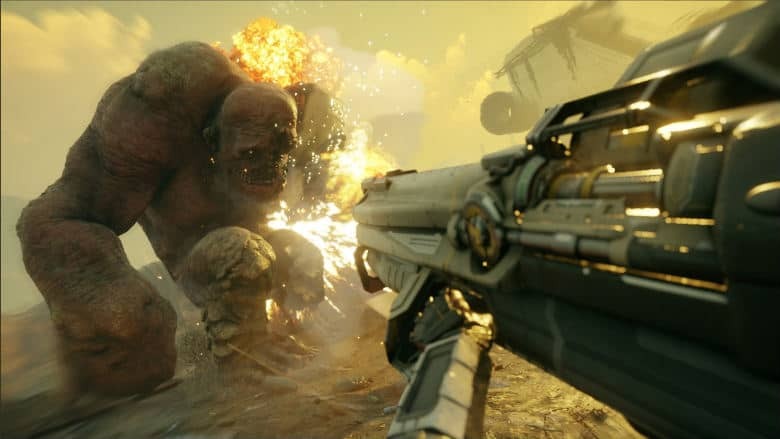 Rage 2 is being co-developed by id Software and Avalanche Games. With Bethesda calling the latter “masters of open world mayhem” and the former “gods of the first-person shooter”. Avalanche released Mad Max back in 2015. id released the original Rage in 2011 and developed the Doom reboot which launched in 2016. Perhaps one of the more notable elements of the trailer are all of the huge “bosses” that seem to exist. Between car battles and these huge, hulking beasts that look like a blast to take down, Rage 2 is looking promising to say the least. Bethesda hasn’t said when we can expect to get our hands on the sequel. But with E3 next month, there’s a decent chance we’ll be getting that news during Bethesda’s conference.